Recent events – the desire by our current government to commit political suicide, and half the population to commit economic suicide – have somewhat over-shadowed the past couple of weeks, but prior to the UK imploding very messily, I spent a weekend in Stockholm at Fantastika 2016, this year’s Swecon. It was my second Swecon, and my third Nordic con. My first had been Fantastika 2013, in the same venue as this year’s Fantastika – the Dieselverkstaden in Sickla, an area to the south of Stockholm’s city centre. I flew to Sweden early on Friday 17 June. I’d been panicking a bit because I’d had trouble finding out where I was supposed to check-in online, but fortunately I got it sorted the evening before I flew. And when I boarded the aircraft – a Norwegian Boeing 737-800 – I discovered I had one of the seats by the emergency exit over the wing. In other words: leg room! 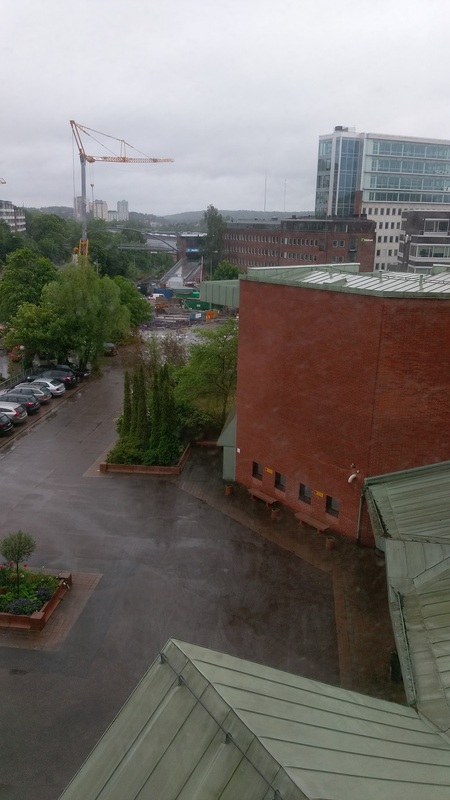 After landing at Stockholm, I caught the Arlanda Express into the city-centre – SEK 280! 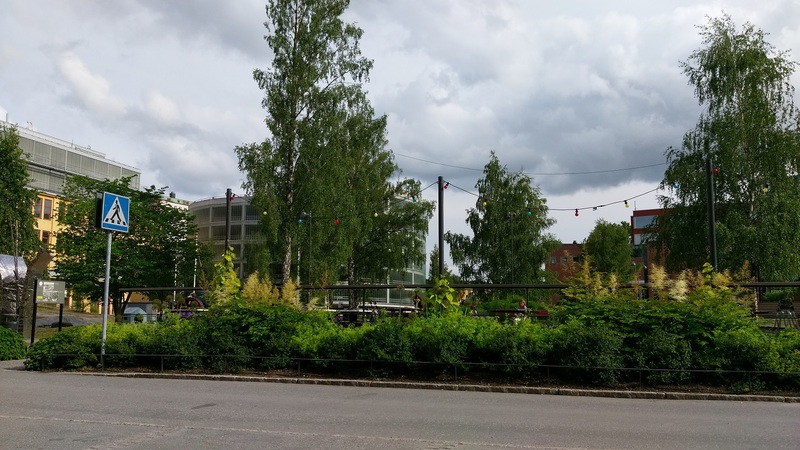 – where I met up with Tobias Bodlund. We caught the Metro to Gamla stan, and had a burger and a couple of beers. The plan was to cross the bridge to Slussen and catch the Saltsjöbanan urban railway to Sickla… But it seemed the railway was closed as they were extending it or something, so we had to catch a replacement bus. The weather was hot and sunny, and the bus was like a sauna. I checked into my hotel, showered and then headed over to the Dieselverkstaden to register… Early in the evening a group of us ate at the Italian restaurant just by the Diselverkstaden – although “restaurant” is perhaps a bit strong. You picked your food from a variety of bowls of saucers and pasta in a display counter, they dished it out onto a plate, and then stuck the plate in one of a dozen microwaves on a shelf behind the counter. Despite that, the food wasn’t that bad. Later, I caught one of the programme items, a conversation between GoH Caroline Mullan and Linnéa Anglemark. Next was Jukka Halme’s infamous quiz, which I was told I had to go to… and where I was immediately volunteered to be one of the contestants. Jukka’s quiz is designed to be difficult, and the scoring can be a bit random, but it’s also intended to be entertaining. Which it certainly was. Our team was international, with GoH Jerry Määttä (Sweden), Thomas Recktenwald (Germany) and myself (UK). We also won. By a thumbs up. (The audience managed to score the same number of points – don’t ask – as us, but we’d managed a thumbs up for a close guess on one question.) Apparently, the score keeper – a volunteer from the audience – normally wins. I also managed to answer one of the “four fields” questions correctly and scored the full two points, which has apparently never been done before. I had another beer or two after the quiz – unlike the last Fantastika, they’d set up a small bar in the concourse area outside the two auditoriums used for the programme. The next morning when I woke up, it was chucking it down. And it rained most of the day. I wondered if I’d brought the weather with me from the UK. Breakfast was packed – there were at least four coach parties, one British, staying at the hotel. Fantastika 2013 had taken place in October, and the hotel had been a lot less busy. Back across to the Diselverkstaden to catch a few programme items and several wanders around the SAAM/Alvarfonden book room (a Swedish fan charity which sells secondhand books, mostly UK and US paperbacks, for SEK 10 to SEK 30). Tobias and I ate lunch at the Mexican taverna next to the Italian restaurant. Then it was an afternoon of programme items, visits to the book room, and the occasional beer. I ate in the hotel restaurant that night as I was on a panel at 6 pm, which was apparently when a lot of people went for dinner. The panel was titled “That’s why I killed him!” and was about character motivation. On the panel were GoH Maria Turtschaninoff, Anna Jakobsson Lund, Mats Strandberg, myself, and moderator Markku Soikkeli. I thought the panel went pretty well – and I was surprised when Markku asked me about the motivation behind the title character in my story ‘Barker’. (Easy: he’s based on a dog…). After hanging around, drinking beer and chatting in the Diselverkstaden until around midnight, I headed back to the hotel. Sunday was a quieter day. The con seemed to be winding down from around mid-morning. By mid-afternoon, when GoH Carolyn Ives Gilman had her signing, people were starting to leave. (I’d brought copies of her books for her to sign but, annoyingly, only realised I’d forgotten her debut, Halfway Human, when I landed in Sweden. Gah.) After the closing ceremony, led off by acapella singing by the Gléowine chair and closed with the spirit of Swecon being handed over to Kontur (Uppsala, 26 to 28 May next year), those of us that remained had the dead dog party in the Dieselverkstaden’s Bistro (last time, it had been in the Bishop’s Arms, a UK-style pub). The weather was nice and pleasant – bar the occasional shower – so we carried on until the bar closed. And when we moved across to the hotel, we managed to catch one more round before its bar closed. My flight back to the UK was at 6 pm on the Monday, so I had plenty of time to kill. I woke up early, panicked a bit because I’d forgotten to check-in online the night before, but managed to do it on my phone (and discovered when I boarded the plane that evening that I’d once again got a seat by the emergency exit over the wing; result.) After checking out of the hotel, I took a taxi to the Centralstation, where I dumped my bag, and met up with Tobias. 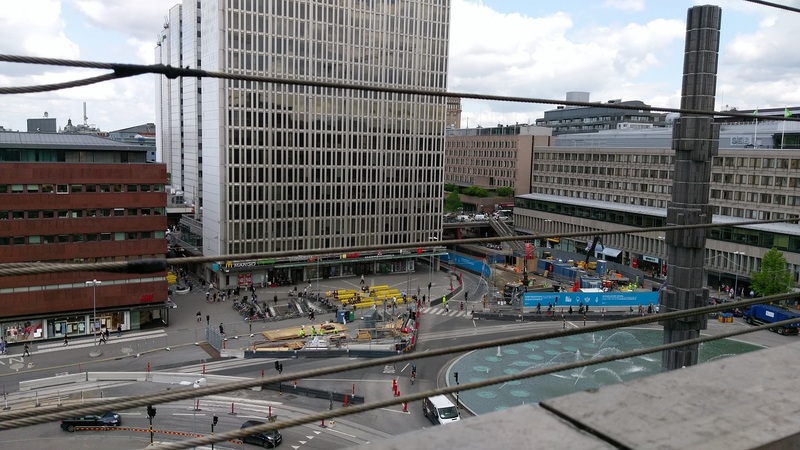 We went for lunch at the rooftop restaurant in the Kulturhuset, which overlooks Sergels torg. It was hot and sunny, just like it had been on the Friday (when I was also carrying a heavy bag around with me). After lunch, I said my goodbyes and caught the Arlanda Express to the airport, where I planned to kill the rest of the afternoon. The last time I’d flown from Stockholm had been on an early October morning, and the airport had been deserted. It wasn’t this time. It was heaving, and there weren’t many places left to sit. Three years ago, I’d had an excellent time at Fantastika 2013, so it had always been my plan to attend another Swecon. When I learnt Fantastika, in the exact same venue, had been chosen as the Swecon for 2016, I knew I had no excuse not to go. And especially since I’d met a lot more people in Nordic fandom at Archipelacon last year… And yes, this Fantastika was a good as the earlier one, if not better. Not only are the Swedish (and Nordic) fans extremely friendly, but they’re also still focused on celebrating the books and stories that fandom is actually about. While there was a panel on the novels Robert Heinlein – which was actually very interesting – there were also lots of discussion of current science fiction and fantasy works. The experience reminded why I became a fan myself. I really ought to shout out to all the people I spoke to over the weekend, but I’ll probably go and get a forget someone – but I’ll have a go anyway. Here, in no particular order, goes… Tobias, Johan, Luke, Fia, Kristin, Erik, Jukka, Jessica, John-Henri, Caroline, Brian, Chris, Barbara, Anders, Jukka, Carolina, Thomas, Patrik, Jerry, my fellow panellists, Tommy, Flemming, AR, Karin… and if I’ve missed anyone, I sincerely apologise. As mentioned earlier, next year’s Swecon is in Uppsala. I’m hoping I’ll be able to go. And if not, there’s always Worldcon 75 in Helsinki in August next year. Categories: conventions, nordic fandom, science fiction, swecon, travel | Tags: conventions, fantastika 2016, swecon, sweden | Permalink. Despite only being careful and not quizzing every eaterie on the ingredients in their meals, I managed to avoid making myself ill. One café we visited labelled some of its sandwiches “laktosefrei”, but that was the only place I saw doing so. I ate Italian twice, Arabic, and on our last night in Berlin – typically – we discovered Nikolaiviertel just down the road from our hotel, which contains a number of restaurants/bars serving German food. One thing worth noting, however: when in Berlin, don’t wear a black collared shirt with epaulettes. I did, and some bloke wandered past me muttering something about “Totenkopf”. In all, definitely a place worth visiting, in spite of the weather, and I’d certainly go again. When I was in Aachen in 1992, we considered spending a weekend in Berlin, but discovered we were closer to London and that it would take about nine hours by train. (Even now, it’s still seven hours by ICE from Aachen to Berlin.) It’s a pity we never made the effort, but at least I’ve rectified that now. Categories: travel | Tags: berlin, germany, holiday, travel | Permalink.